Description: Loosely tufted perennial with slender rhizome. Culms terete, 1-grooved, smooth, 18–60 cm high, 0.3–1 mm diam. Leaves with filiform blade < 10 mm long; sheath reddish to straw-coloured, striate, papillose between striations, glistening; ligule membranous, with base of blade pubescent. Inflorescence a single spikelet or up to 9 pedicellate spikelets in a loose cluster, drooping or erect, 0.5–4 cm long; involucral bract shorter than to as long as inflorescence. 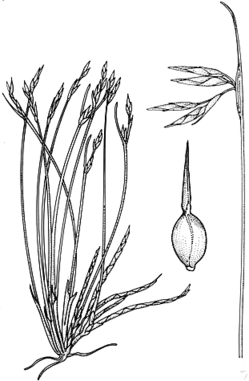 Spikelets terete, usually 1-flowered, rarely 2 or 3 flowers, 4–6 mm long. Glumes long-acute to mucronate, subdistichous, glabrous or ciliolate near apex, mixed red-brown and straw-coloured to greyish with age; lowest 2 or 3 glumes empty, about half length of upper glumes; upper 2–4 glumes 3.5–4 mm long. Hypogynous bristles absent or 4 to 1.5 mm long, flattened to filiform, remaining with inflorescence. Stamens 3; anthers 1.5–2.5 mm long, excluding appendage 0.3–0.5 mm long. Style 3-fid; style base conical, hispidulous, as long as or slightly exceeding body of nut. Nut ± terete, obovoid to ellipsoid, 1.8–2.5 mm long, 1.0–1.5 mm diam., minutely wrinkled or reticulate, straw-coloured, ± dull, usually 3-ribbed, with 3 or 4 small disk-like thickenings at base. Distribution and occurrence: Coastal areas south from Stroud, extending to Blue Mtns and eastern ST (Budawang Ra. and near Bombala). Grows in moist heath to forest, on sandy soils. This name is used in the broad sense. It includes slender and coarse forms, which are currently being studied.